Even when there are multiple patterns and textures present, having a strong color palette helps to keep everything balanced and cohesive. When the majority of the room is within the same family of hues, it makes it a lot easier to add those fun statement accents without it becoming overwhelming. When the size of the patterns are all the same, the result can make your eyes cross - you've probably seen this before and it is not pretty. Having different sized patterns allows each one to shine on their own and complement rather than compete. Most often you will see large, medium and small scale patterns together. If used to complement each other, it will create movement without being too busy. 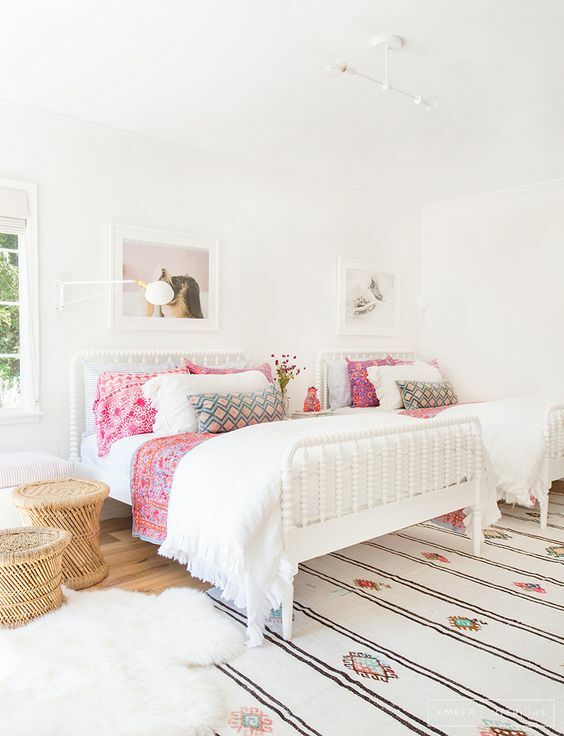 The patterns will encourage your eyes to bounce around the room, and when done correctly, will not create crazy visual clutter. 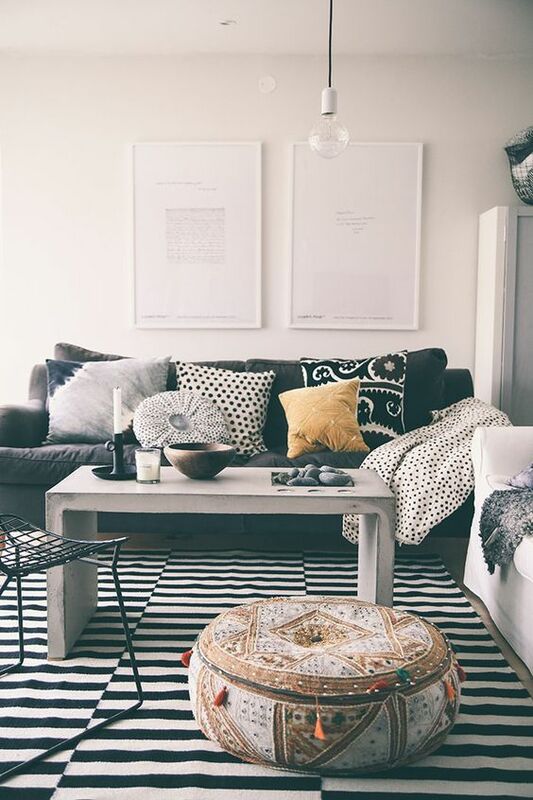 If you want to play it safe at first, try a larger scale pattern on a bigger surface (like an area rug) and keep the busy patterns on smaller items (pillows/vases/etc). These elements are really important in helping tone down the patterns and aid in eliminating that visual clutter we just mentioned. Imagine if all the patterns were layered on top of each other without any solid to help break it up- yikes. The mixture of contrasting solids (i.e. the grey Euro pillows and white lumbar on the bed in the last photo) becomes a backdrop for the patterns to stand out. This creates a pause point for your eyes, giving them a chance to rest. Mixing in solids is also a great way to add texture (our favorite!). 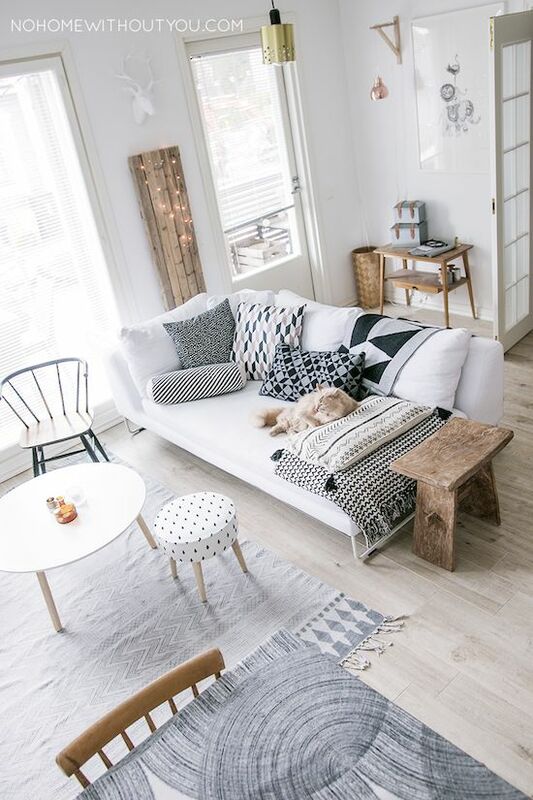 Soft, woven, linen, rough, smooth -- these are all great examples of textures you can add into a room that will help to create a warm, inviting space to give it that cozy, lived-in feeling we love. This is a mix we are always trying to achieve in our designs. Depending on the size of the weave, textures can actually appear to be yet another subtle pattern, without bringing in more color. Check out our recent restyle of this master bedroom where we mixed patterns in a subtle but impactful way. Notice the space has a specific color palette, mixes different patterns, has contrasting pieces and incorporates several kinds of texture. Your goal is for everything to complement each other and for your eyes to move about the space. If your eyes are stuck in one spot, try spreading the pattern around! 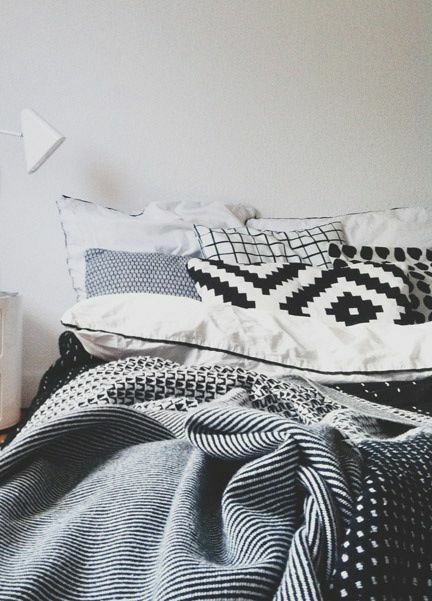 Tell us some of your favorite ways to mix patterns or post any questions in the comments section below!